I just adore this time of year and enjoy any excuse to get festive. To get in the Christmas mood this year, I decided to make my own advent calendar. I love the idea of having personal little treats every day so I got to work. Some sweets and festive chocs. Peg board. I got mine from eBay: eBay and painted it in Rust Oleum Chalky Matt Furniture Paint in flint. For the display I also used our cute pink lightbox, you can get yours here. I then used our labels and stickers and wrote the numbers from 1 - 24. I sealed each paper treat bag with washi tape then taped bakers twine in a loop on the back so it can be hung on the peg board. For the paper cups, I tied bakers twine around the lip of the cup and created a loop for hanging. I didn’t seal the tops of my cups but you could cover with a circle of paper or tissue and then tie the twine of the top of that. The balloons are a fun idea. I think next year I’ll do all 24 days with balloons! These are a bit trickier to fill and I found they worked best with smaller and flexible toys. The stretchy dinosaurs worked perfectly! I also added a few gold stars and a rolled up note. It will be so much fun popping these balloons to retrieve the goodies inside. To add the days on the balloons I used a couple of methods, on the smaller ones I wrote directly on the balloon with a permanent marker. I also wrote the number on a tag and dangled it around the neck of the balloon along with a loop for hanging. I then hung each little parcel randomly on the peg board and draped a festive garland in front with some little fairy lights to add a bit of sparkle. If you’d like some more ideas, I found a few other fab DIYs that you could get inspiration from and put Pinterest board together for you. Take a look below. The lovely thing about making your own is you can really personalise it for the recipient and works for anyone of any age! 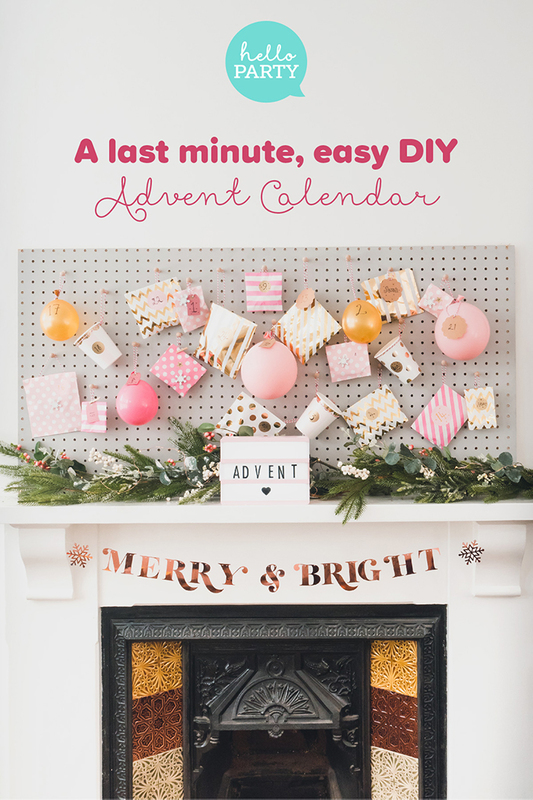 I really enjoyed putting this together and would love to hear if you make an advent calendar and how you go about doing it! To keep in the festive mood, we are running a Hello Party advent (find out more here) so we'll be bringing you some goodies, treats and special offers throughout the month of December. THIS IS NOW CLOSED but you can still sign up for our newsletter. Sign up and receive a 10% off code to use for your next order at helloparty.com.